At certain times you may need to increase the pension contribution percentages for more than one employee at a time. This is most common at the beginning of a tax year, as the ‘Minimum Contributions’ that must be paid into an Automatic Enrolment Workplace Pension Scheme increase (although it is also possible that an employer may wish to increase the pension contributions that they make at other times of the year too). Minimum contributions are being introduced gradually over time, and are shown in the table below. Payroll Manager allows you to specify and store the ‘Default’ rate for employee and employer pension contributions for each of your workplace pension schemes, and provides a quick way of applying these new rates to all applicable employees at the same time. When can I enter the new percentages? You can only apply increases to pension contributions for the tax year of the file that you have open. e.g. if the payroll file you have open is for the tax year 2018-19, then you can only edit percentages for pay periods within the 2018-19 tax year. If you wish to make changes for 6 April 2019 onwards then you should wait until you are able to create a file for 2019-20. 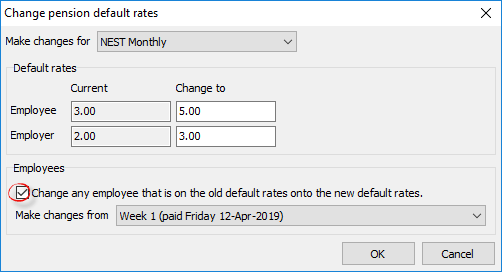 This feature will be available in Payroll Manager in March 2019, and as part of the procedure in creating this file you will automatically be reminded about the new minimum contribution percentages. – If your current default percentages are lower than the new minimums then these will be displayed in red. Click on the ‘Change defaults‘ button to update the percentages. – A box will appear asking “Are you sure you wish to make these changes?” – answer ‘Yes‘ to proceed. – The screen will now display the new rates applicable to each employee – click ‘OK‘ to continue. – The new rates will now be displayed on the ‘Pensions‘ section of the ‘Pay Details‘ screen, There is also a report available which shows contribution rates for all employees so that you can check that you have updated the percentages correctly. 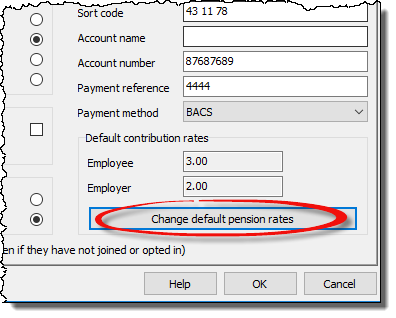 Click ‘Pensions‘ then ‘Employee Pension Rates‘ from the main menu in Payroll Manager to view this report. Q. What if I forget to change the rates and need to do it later? – Click ‘Pensions‘ then ‘Pension Scheme Details‘ from the main menu in Payroll Manager, and select the appropriate pension scheme. (Note, if you have more than one pension scheme in use then you will need to repeat this procedure for each scheme). Q. Can I apply the new minimum contribution rates in advance of the 2019-20 tax year? A. 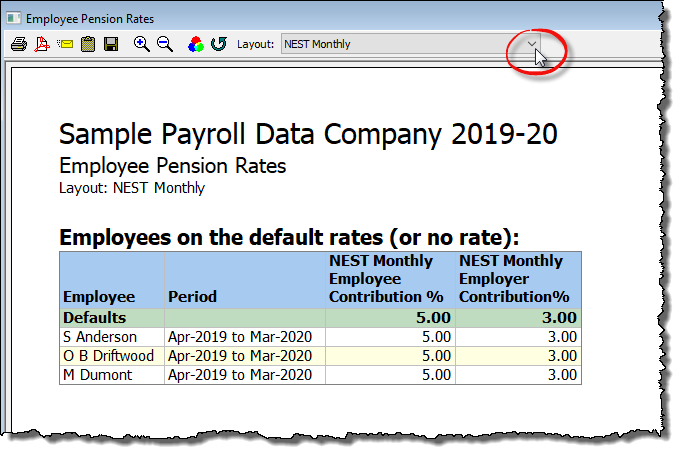 No, you will need to wait until you have created a Payroll Manager file for 2019-20 in order to apply the new minimum contribution rates, and this facility will become available in March 2019. Payroll Manager will automatically prompt you to review the pension contributions at this point. It is possible however to communicate the upcoming changes to your employees in advance (see below). Q. Do I need to inform my employees about the new minimum contribution rates? A. The Pensions Regulator states that there is no legal requirement for an employer to communicate these changes to their staff, although it is considered good practice to do so. Payroll Manager is able to produce a standard letter (*based on The Pensions Regulator template) which can be issued to each employee to inform them of these changes. 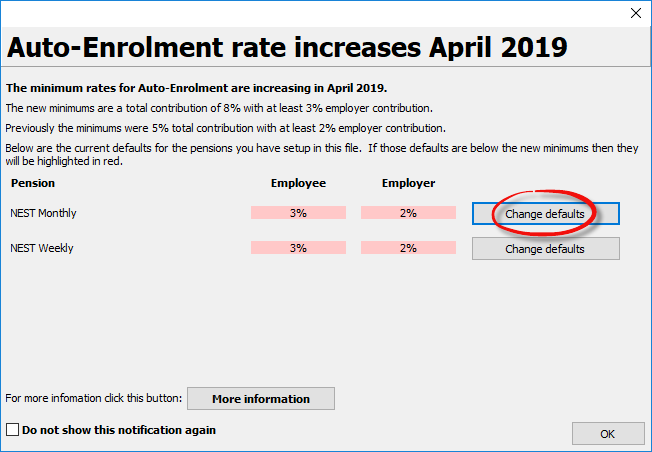 Click ‘Pensions‘ then ‘Letters‘ and choose the option ‘Rate increase April 2019‘ to produce these documents. These letters can be produced at any time from the software – i.e. they can be produced whilst you are still working on the 2018-19 data file.